When my friend Kristin asked me to make cupcakes for her son Micah’s first birthday of course I was super excited about it! My cupcakes were going to be the first sugar baby Micah would get to eat! 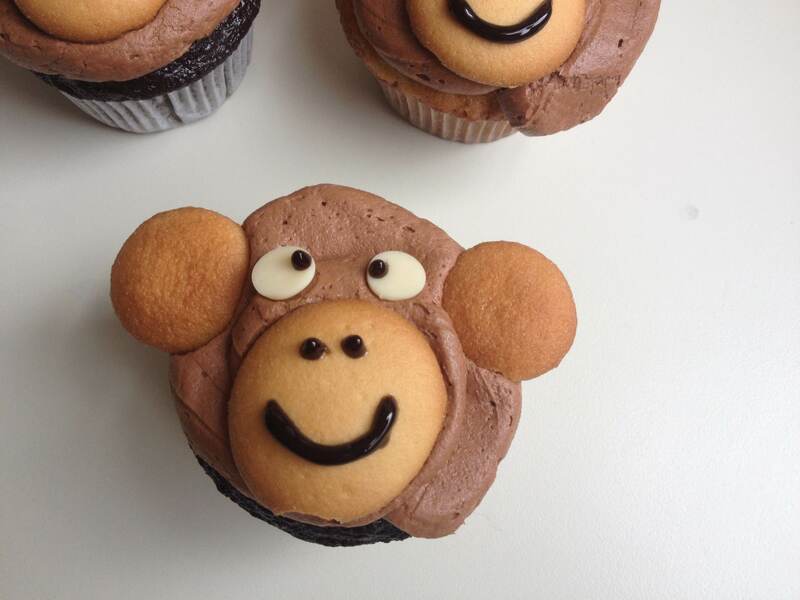 Then, when she decided on a jungle theme for the party and asked if I could make monkey cupcakes, I was even more excited. 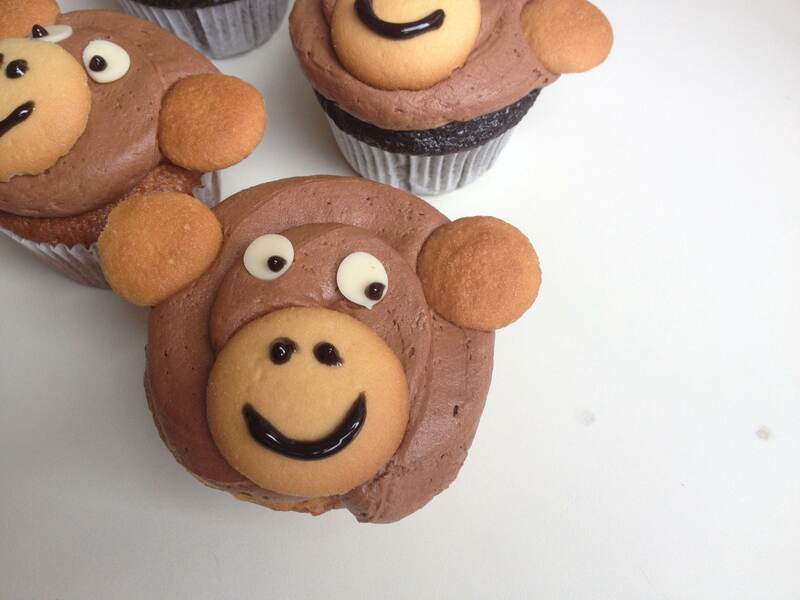 I had the perfect cupcakes that I had pinned oh so long ago and I knew they’d be great for this occasion. 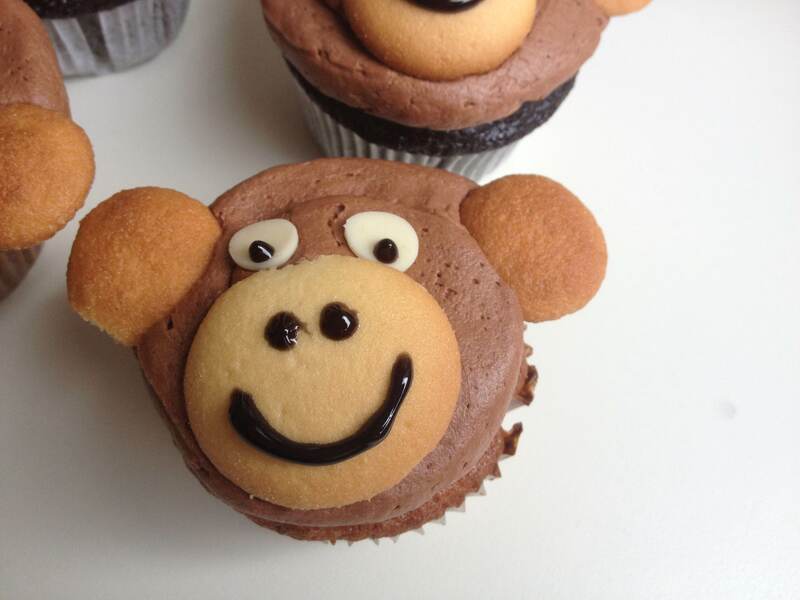 Kristin and I decided on half chocolate cupcakes and half banana chocolate chip cupcakes because, well, how cute is it to have banana flavored cupcakes that look like monkeys?? I went with one bowl chocolate cupcakes since they are my ultimate favorite chocolate cupcake recipe. They always come out perfectly, it’s a no fail recipe if you’re looking for a good chocolate cupcake. And for an extra bonus, you only have to use one bowl so less to clean! For the banana chocolate chip cupcakes I went with a recipe I had made very early on in starting my blog. But instead of the butter, I used canola oil since I think it makes for a moister cupcake. I also used about half the amount of chocolate chips because I didn’t want them to be too chocolatey. Blasphemy, I know. But I figured since I was making chocolate cupcakes already and both kinds were going to have chocolate frosting, I didn’t want to go too crazy. Decorating the cupcakes were super easy. I just used large and mini Nilla Wafers for the face and ears. It did become a little ridiculous when I decided to pipe little white chocolate rounds for the eyes. After I had piped about a hundred of them I realized that I had basically made white chocolate chips. It would have been a lot easier had I made them but what can you do. The last step is to use black gel frosting to pipe on the eyes, nose, and mouth. I liked positioning the eyes differently so that the monkeys look like they have different expressions. Some silly and some serious. I’m not going to lie, I like my cupcakes better than the original ones I pinned! The monkeys definitely fit in with the jungle theme of Micah’s birthday and he had a huge monkey balloon tied to his highchair so it was perfect! Can I tell you how chillaxed little Micah is? I mean that boy almost never stops smiling. And it’s so adorable how he loves driving his little car around with his arm hanging out the window. Parents hide your daughters! 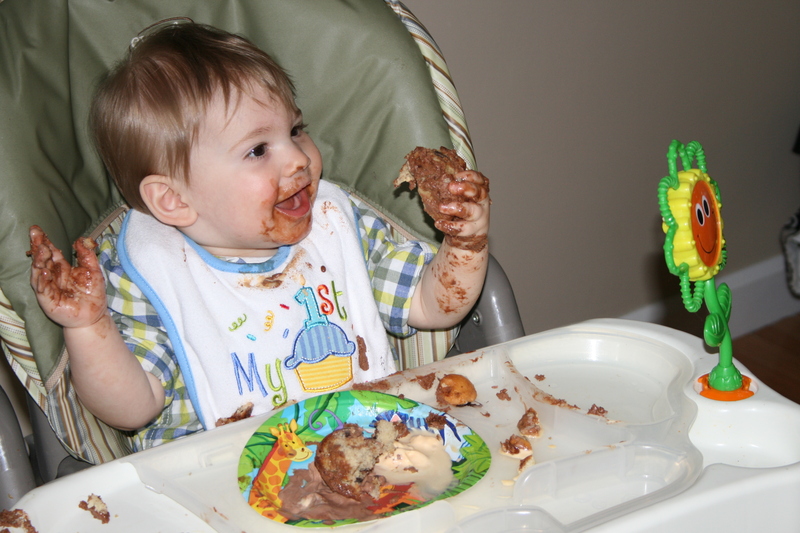 I’m pretty sure he enjoyed the cupcakes as you can see from the picture. He seemed a little reluctant at first and unsure but once he got a taste, he really dug right in. I was so happy to see that mess all over him but I don’t think it was as exciting for mom and dad to clean up! Micah definitely had a good birthday and we loved celebrating with him!